In reality, we think SEO is really easy, especially for the blogs. Writing up the contents, sharing all over, getting some backlinks and we are done, right? Yeah that’s true, but unfortunately I have to say we are missing the great part behind it. No doubt the process we discussed might be able to get higher rankings. But what if search engines couldn’t properly crawl and index the pages? All your on page efforts will be wasted. It’s really good to work very hard for on page and off page elements, but we have to be careful either the search engines can easily go through the site or not. The good news is, if we can help search engine crawlers to crawl easily, they might reward us with higher rankings. The more crawling and indexing frequency means the more authority and ranking. So we need to know how we can help in their process. 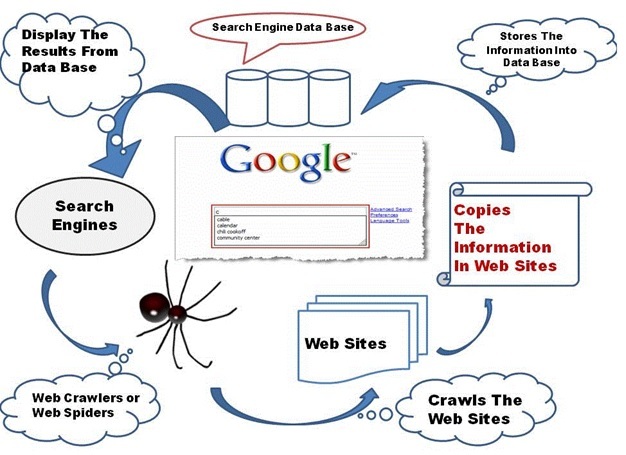 SE crawling is the process of going through a website and collecting possible data by the crawler bots. After collecting data, they report them to the indexing department of search engines. Actually the crawlers can go through only links. They will not automatically find and analyze the websites. You have to make resources for them. Either they will follow a link or not totally depends on the dofollow or nofollow attributes of web links. Dofollow declares to follow the link, contrary nofollow declares not to follow the link. Indexing is the process where the search engines will analyze the gathered data by crawler bots and index them on their search database depending upon the quality. First of all they trim all the page excepting texts. They process the words and find out most appropriate keywords from it. Then they give it a rank determining the content quality. The indexing process can be stopped by declaring a meta robots tag with noindex value. Noindex means do not index the page on search directory. Sitemap.xml is a simple xml document that contains all the website links and hosted on the same website. The document sets priorities for the links based on the values and defines when the bots should re-crawl it. So usually the homepage gets highest priority and the posts get the lowest. Actually, it’s tough and lengthy for crawler bots to find each link and index them. So if we list all the links on a single page and tell them to crawl from here, the process will be quite easier and faster. So you should now create the file. You might probably ask how to create it? Here is what Google guides to create sitemap manually: https://support.google.com/webmasters/answer/183668?hl=en. Or you can use an online generator. Just head over to XML Sitemaps, enter your blog url, submit and download the file. Now upload it to your site’s root directory and that’s it. Have you done it? Now we have to tell the se crawlers that we have got our sitemap. Logon to the webmaster tools such Google Webmasters, Bing Webmaster and submit your sitemap url. After that, the crawlers will start following the sitemap. Robots.txt doesn’t directly help in indexing but there are still some advantages. It’s a file that instructs the crawler which page to crawl and index which page not to. Sometimes the bots feel a bit confused whether to go through or not. In that case, if there was a clear statement, there won’t be no more confusion. So it is recommended to create a robots.txt file and declare what to index. Need help with formatting the txt file? You might check this guide on How to create a robots.txt file. If you are on WordPress, you can also use this plugin. Want to keep the crawlers busy with your blog? You should probably share your newly created urls on social media platforms like on Facebook, Twitter and Google+. But why? On a Moz case study, it has been proved that tweets increase the indexation rate. In fact, I personally experienced, posts that have been shared on social media got indexed faster than the posts that have not yet. So after you publish contents with new urls, take a few minutes to share it on your social profiles and see the magic. The webmaster tools by search engines are made to keep up the correlation with the webmasters. They have made such useful tools for the users. One of them is the fetch tool. Let me explain how it works. Search engine like Google, Bing has provided a tool to view a page just like a crawler do and submit it for indexation. In this way, a web page can be indexed within 2-24 hours depending on the queries. Whenever you feel a page is not indexed or indexing very late, you can use this tool for instant indexation. But be cautious that it’s not recommended to index all your web pages. Just let the bots do their work for normal and safe indexing. Ping is a XML-RPC based service that nudges the search engines that a url has been updated. So the crawler can get back to it quickly. In this way, an updated page can be notified to search engines instantly. If you want to ping a URL, you can use PingOMatic. Although there are thousands of tools available online for pinging URLs. You can use any of them. But be cautious. Forcing the bots to crawl again and again would be a very bad practice. Doing it every time might hurt your indexation. So I will suggest you to use it only when there is no other way. Crawling and indexing are two important factor your blog. As you care other things, you should add these to your caring list. I personally believe this will help our seo. Because we are helping crawlers to do their work, so they might help us by ensuring better ranking. What do you think about it? I will be waiting for your own thoughts about it…!!! About The Author: Abrar Mohi is a young entrepreneur who is the man behind the blog BloggingSpell (www.bloggingspell.com). He is a web developer, internet marketer and as well as a passionate blogger. Besides his online presence, he is a fun loving person with immense interest of playing games and doing gyms. Interested to know more about him? I use robot.txt method for my blogger blog. Are you saying its not that effective? Robot.txt is really necessary to specify which page to index, which page to not. But it doesn’t directly help to speed up the crawling and indexing process. When I discovered the webmaster tools Google offers, a new – and glamorous world opened. You won’t believe it – but posts that I submit for indexing via the ‘fetch as’ tool get indexed in 10 minutes or less. This awesome features makes the post begin ranking IMMEDIATELY! Also, in these days of ‘copy and paste’ bloggers, it’s quite easy to assert your authority against content scrapers and get Google to punish them. The benefits, in fact, are endless! Well I’m using wordpress and the crawling rate perfect, apart from the default indexing I’d say strong social signals and backlinks would help to improve craw rate. Yeah, you are absolute. Google webmaster tools are offering a wide range of services that could be used to improve our websites. No doubt, fetch as Google tool is one of them that has made it easy to index posts. In fact, as you said, this single tool can protect us from some kinda copy pasting we usually face after publishing a new post. BTW, thanks for your helpful comment and pointing out a great factor. WordPress is already optimized with pinging services. Whenever we update wordpress, it pings automatically. Social signals and backlinks are also help for better crawling and indexing. You’re right buddy. Nwosu’s blog mean some unique and valuable contents. Awesome tips to index blog/site quickly. I also use all of your techniques for a new blog/site and Share New URL in Social Media to index new post quickly for my old blog. Sometimes I also like to use PING to index more quickly and I don’t use Ping service regularly because somehow It may harmful for SEO ranking as I know. Thanks,I find this really helpful. Always keep us updated. Love your comments very instructive and good information. I only would request a search box for your site. I saw an article on slide share that I wanted to follow to its original site but couldn’t find it here on your blog. It was How anchor tags can improve your sites SEO. Well just a thought! Thanks for your information. Nice and straight to the poit tips. Thanks for explaining them in plain and understandable language. Nice and straight to the point tips. Thanks for explaining them in plain and understandable language. Well, set your blog CMS to create “speaking” URLs (…/this-is-a-speaking-URL.htm) instead of “…2345” would also rank high on my list. As fort your initial “SEO is really easy, especially for the blogs” – yes, but since “everyone” thinks so “everyone” makes the same mistakes and half-baked efforts which, in the last analysis makes it a lot easier for the serious players. Because if everyone did put in the same effort, guided by the same exquisite expertise, everyone would be in the “Majestic Million” or “Alexa 100,000” – but since there are about 500 million domains and counting … no one would be. Thank you for this tips… My particular two posts are not getting crawled..It’s giving me a error..can you tell me please what should i do? How can I get to rank well on Google and other search engine. Although all my content are well indexed. Holi 2015 is special eent for indians.